#305: Great location! Right across from Mayo beach and short walk to downtown! An quintessential cottage with modern stylings. #305 Beachfront Four: 50-feet to the water and directly across from Mayo beach, you'll walk to everything (beach, town, restaurants)! Classic Cape Cod charm awaits you in this sweet cottage on the water. 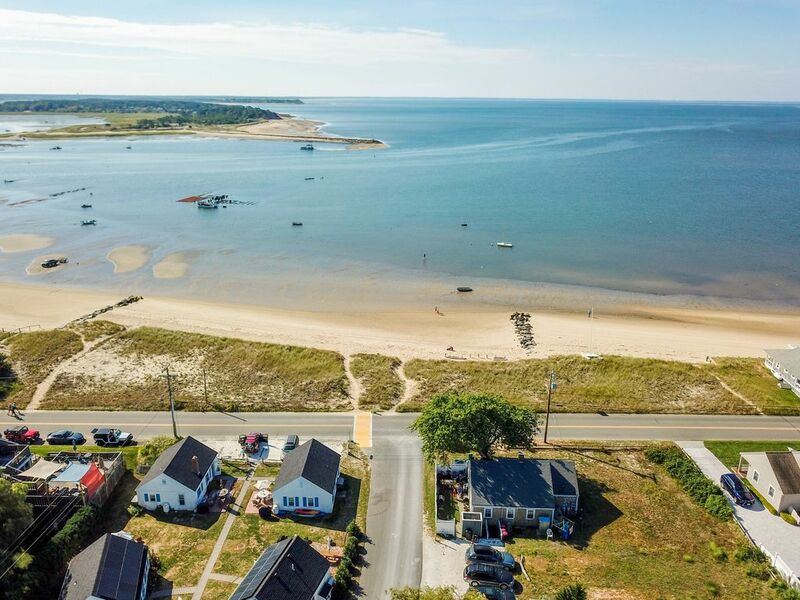 Located directly across the street from Cape Cod Bay, its view will leave you breathless. Watch the boats sail by while enjoying your morning coffee in the living room, grill on the patio at night while taking in a magnificent sunset or take a short stroll down the street to enjoy some of Wellfleet's most celebrated restaurants: The Pearl, The Bookstore Café, Ceraldi and Mac's Shack. Venture just a bit further down the road and you'll be in the center of downtown Wellfleet enjoying gallery walks and square-dancing nights on the Harbor. Outfitted with everything you need to enjoy your stay, and comfortable for up to five people. The vision of Del Mar Vacations was born out of the principle of "The Perfect Stay". The founders of our company frequently experienced vacation homes that were empty and unmemorable. They found themselves wanting for the hospitality and ease one hopes for when they're on vacation at a boutique hotel. Something above the ordinary. Something special. Del Mar started with a simple goal: create a perfect stay for every vacation. We are a Vacation Home Hotel that professionalizes the management and hospitality in vacation homes, turning them into exceptional experiences. Each home is unique with it's own story - but guest experiences should always achieve a quality standard. Have a perfect stay! AMAZING location - great customer service! Couldn't have asked for a better location - right across the street from the beach! The cottage was very clean and well maintained, and within walking distance to the Bookstore Restaurant, The Pearl, and plenty of other great spots downtown. The rental company was amazing every step of the way - I look forward to using them again soon! Great location right across the road from the Wellfleet Bay where oysters are harvested at low tide. Near Mayo Beach and recreation area. Easy walk to the harbor area eateries (Bookstore & Restaurant, Pearl, Mac's on Pier.) Longish walk to town. Beachfront 4 is modest, but clean and comfortable. Grounds are well kept. We enjoyed a great stay at this waterfront cottage. It was well appointed, clean and had all the essentials you might need during your stay. It's in a great location that offers restaurants within walking distance, Wellfleet center within a short drive, and attractions such as the Wellfleet Drive-In within a 15 minute drive. Overall this is a great cottage that we would highly recommend to others looking to enjoy Cape Cod for a few days or a week! I give 4 stars for the cottage and only because when in offseason and cold, the house does not heat up well with just the gas fireplace. Additional space heaters should be readily available to use in unit. Otherwise unit was clean and had everything you need in beautiful area. I give 5 stars to Del Mar because due to a few issues, they were so awesome and accommodating to us. Karen was so wonderful and I appreciate all her help resolving everything and even checking in on us and giving recommendations of the areas. She helped make our first trip to the cape a great one.